The sympathetic nerves are a chain of nerves that run on the front side of the spinal column. They are part of the autonomic nervous system, which controls many bodily functions we don’t think about, such as sweating, heart rate, digestion, and blood pressure. They are located in your cervical, thoracic and lumbo-sacral spine. Another function of these nerves related to the transmission of chronic pain signals. On occasion, for reasons not clear, the sympathetic nerves can develop changes in the way they function. It can result in conditions in which the pain is out of proportion to the patient conditions. It is somewhat analogous to a seizure disorder. What Is a Sympathetic Block? It is a procedure in which a solution of local anesthetic (numbing medication) and sometimes steroids (potent long lasting anti-inflammatory) is injected in a specific system of nerves called the sympathetic nerves. The purpose of this injection is to treat conditions that are associated with pain, which originates in the sympathetic nerves. It is also use to identify or exclude a specific source of pain, so proper treatment can be instituted. The procedure can be performed as an outpatient, in the office, hospital and out patient surgical facility. . The procedure is usually performed under intravenous sedation to assist in comfort and relaxation. This decision will be made based on individual preference and medical necessity. Oral medications are also available to assist with relaxation before and during the procedure. You will be taken to the procedure suite, place in the fluoroscopy bed lying on your stomach. Blood pressure, oximetry and cardiac monitors will be applied. Next, the skin overlying the painful nerves or areas will be cleansed with a sterile solution. Then a solution of local anesthetic (numbing medication) and an anti-inflammatory (steroid) is injected into a specific sympathetic nerve, under fluoroscopic guidance (X-Ray machine). Prior to the injection, a small amount of contrast (X-ray dye) in injected to confirm proper placement. According to the location, specific responses will dictate the effectiveness of the block. 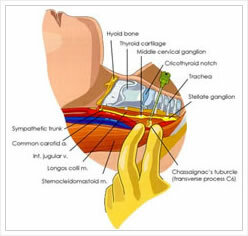 I perform in the neck, is called a Stellate Ganglion Block and resultant increase in the same upper extremity temperature is indicative of proper response. If done in the lumbar area, a resultant increase in the leg temperature is indicative of proper blockade.